Wash the palak leaves thoroughly. Add some water and blanch them. ie- either boil the leaves or pressure cook them for one whistle. Keep it aside till it cools. Once done grind the blanched leaves in a mixer to a fine paste. 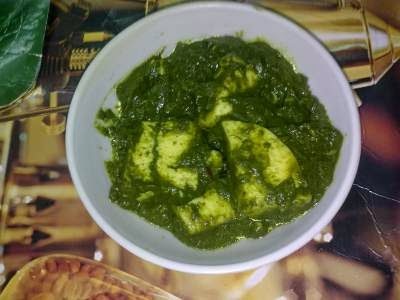 I have used home-made paneer as it is much more tasty as compared to the store brought one. Chop the onion,green chillies,tomato fine. Make a paste of ginger and garlic.Again you can use ready-made ginger-garlic paste, but home ground paste is always my choice. Fry the paneer cubes till golden brown. Remove the cubes, now add the chopped onion. Saute the onion, then add ginger-garlic paste and green chillies. Fry for about 2 min, then add chopped tomato. Add the masalas -haldi,mirchi,dhaniya,jeera and salt. Let the masalas cook.Add a pinch of sugar for taste. Add the palak paste,fried paneer cubes and cook for about 2-3min more. Just before turning off the flame, add fresh cream and give it a stir.